Home DIY Projects	Halloween Candy Jars! Happy Thursday, everyone! This post is a throw back from a few years ago and is still one of my favorite DIY projects. Come see how simple it is to turn sliced pimientos jars into Halloween Candy Jars! These make cute gifts and decorations, too! 2-Take the clean, dry lids outside and prepare for paint. I like to make several at a time. 3-Spray paint the lids orange and allow to dry. Make sure you paint around the edges. A few light coats of paint usually does the trick. Aren’t these the sweetest little jars? And they fit in perfectly with any fall decor. 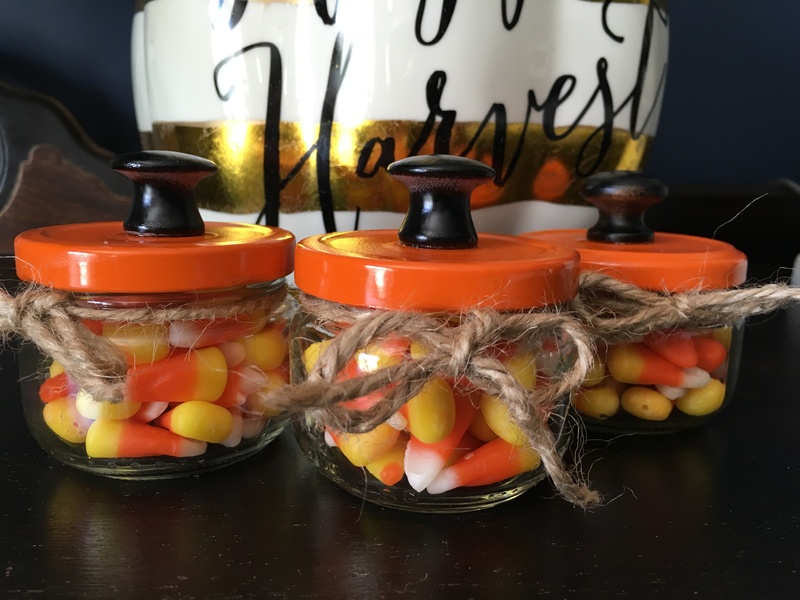 I used candy corn because it looks so festive with the colors of the jar, but you could also use candy pumpkins or any other Halloween candy. I gave a few of these to my fairy-godchildren since they love candy corn and I love them. These are so cute and fun to make. And they are fun to give away too! Because this is so simple, let the kids in on the fun! Perhaps a gift for your child’s teacher or a sweet neighbor? Just remember, these are made of glass and are breakable so obviously exercise caution when giving them to young children. Safety first, right?